Ms. Cowen-Hirsch brings a sense of internal drive and mission-focused passion to her current position as Inmarsat’s Senior Vice President for Government Strategy and Policy in the United States Government Business Unit. Hosted payloads have long offered the potential to increase the tempo of government and commercial innovation through lower cost access to space. Report, offered was a report from a conference held in October that focused on the uses of hosted payloads and small satellites (smallsats) to accomplish government missions. 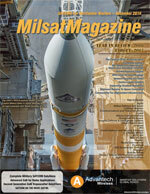 Improving Cubesat/Smallsat Reliability, By Christopher Alfenito, Director of Sales and Marketing, Modular Devices, Inc.
SpeedCast recently partnered with NEDA Telecommunications to provide connectivity to the Government of Afghanistan.